The heritage movement in this province has been around long enough now — we should have some good, thoughtful writing about what it is, where it came from and where it’s going. But this seems in short supply. Or maybe it's just hard to find. We have a few important articles about the history of the preservation movement in Ontario and the development of our heritage legislation. I’m thinking especially of Mark Osbaldeston’s article, “The Origins of Heritage Preservation Law in Ontario”, published in 1995 in the The Law Society Gazette; and Victoria Angel’s 1998 thesis paper, “The Ontario Heritage Act and The Provincial Program: An Alternate Model for Heritage Conservation.” Both of these should be read, or re-read, by anyone interested in the history of our heritage policy and legislation. And there are a handful of government publications, all likewise old, but not necessarily dated. 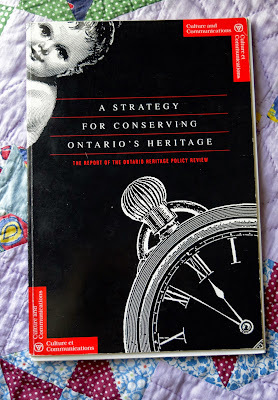 Perhaps the most significant of these was released 25 years ago this spring: A Strategy for Conserving Ontario’s Heritage: The Report of the Ontario Heritage Policy Review. 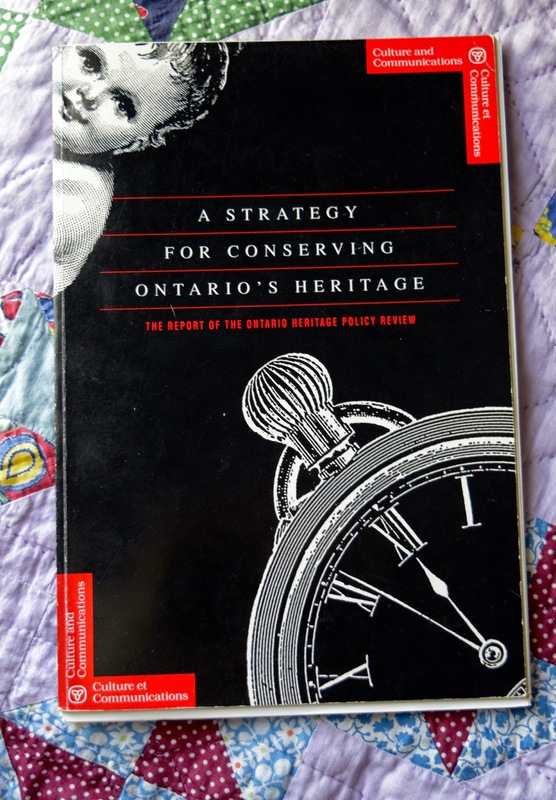 The report — known in-house as the “black baby book” because it had a black cover with a cherubic baby face in one corner — was the first government document to look at cultural heritage in Ontario in a big-picture way, providing a coherent policy framework for the conservation of our heritage, before getting down to the “strategy”, the details of who-does-what. Like most government reports it had a limited shelf life, especially as the Liberal government of David Peterson, which produced it, was defeated later that year by Bob Rae’s New Democrats. But there are a small number out there — including some who did not work on it! — who still remember this report and think highly of it. Ontario’s heritage is that part of the collective heritage of all humanity for which we have particular responsibility…. Heritage provides rootedness, an often underestimated and neglected human need…. Try to get your hands on a copy. I am definitely one "of a small number" [who think highly of the black baby book]. I also agree about the lack of writing although I think a great deal gets done in the grey literature, as always, that never sees the proper light.